Our bathroom, it’s one of the places we spend most of our time. We bought our home a year ago, and while it’s a century home, it didn’t need much updating. The kitchen is new and bright, crown molding trails throughout our home and the wooden floors are polished. 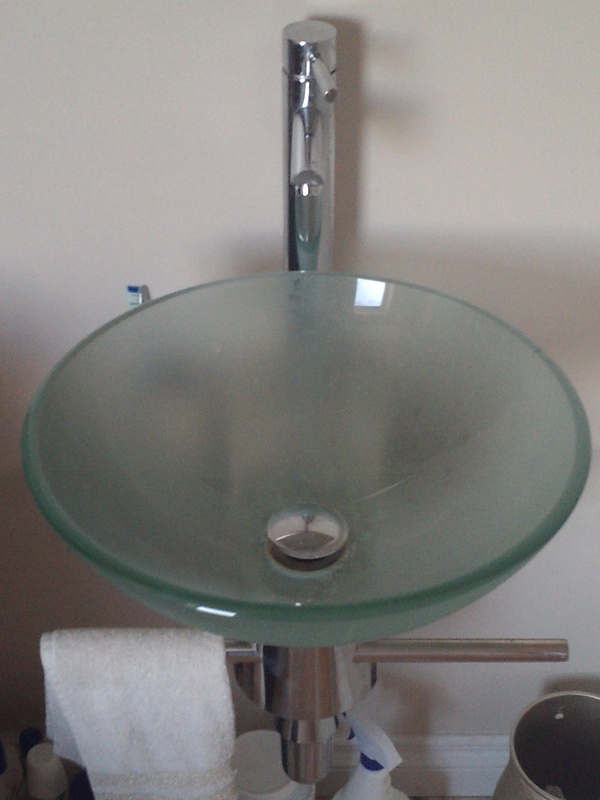 Somehow when we purchased our home we over looked the dated and dingy bathroom. 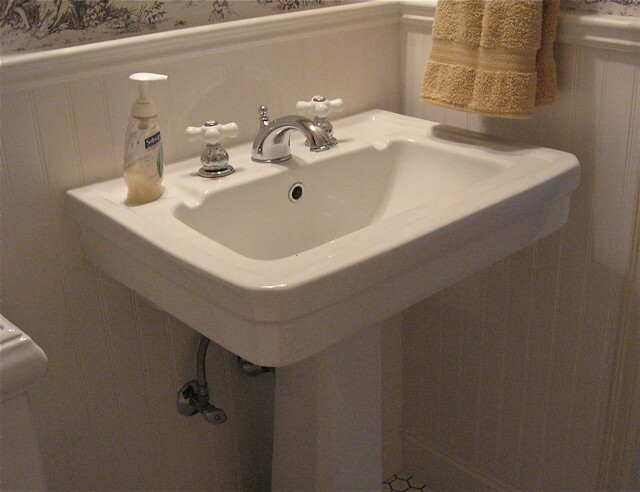 We had the luxury of having an old cream pedestal sink and no cabinet space or towel racks. The tub could barely fit a toddler, and my husband and I are both tall and lanky. It was one of those tub and shower combos with cracks in the bottom and that water level would only get three inches high. Our shower head was an ancient plastic piece of junk that trickled water on a good day. Our light above the sink broke, and a friend managed to break our mirror so we had no mirror or light for over eight months. Talk about roughing it, but somehow I got used to not looking at myself as much and procrastinated the major renovation. Finally my husband forced us to get it going before summer and it was up to me to design, measure, purchase, and over see the entire renovation. So off to the drawing boards. We had a few things in mind for our new bathroom. 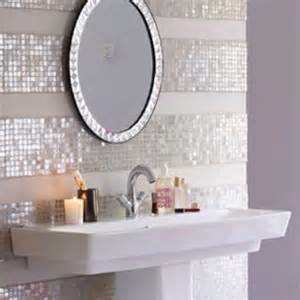 At first I wanted a giant tub with a cool back splash of tile behind it, and a stone shower in the corner, but the space wouldn’t allow it. I had to re-plan. 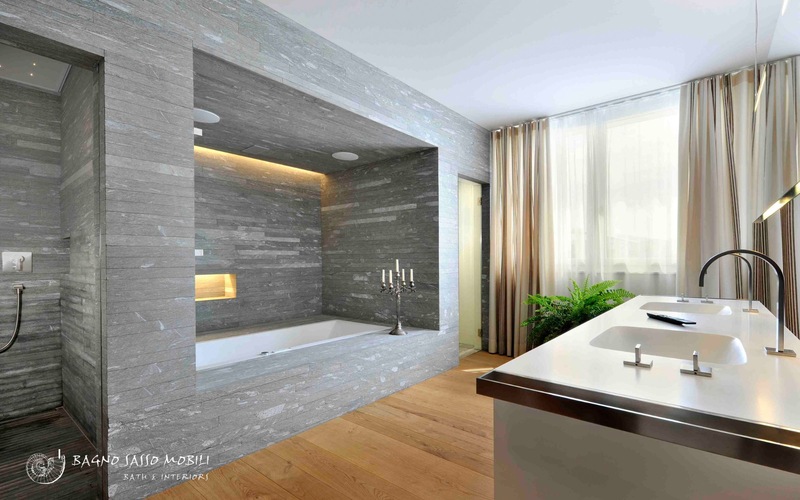 When starting a bathroom renovation the first and foremost thing you want to do is measuring of the basics, tub, toilet, sink. You will want to order your tub first since it could take 2-4 weeks to be delivered. It was the first thing I did once I found the perfect tub, and it sat in the box for three weeks while they ripped out our bathroom. The day the renovator was ready to install they noticed a corner of the tub was chipped! I had to do a complaint, resend the tub back to home depot, pay for a second one out of pocket while we waited for a refund. This set our whole renovation back three weeks. It was painful! 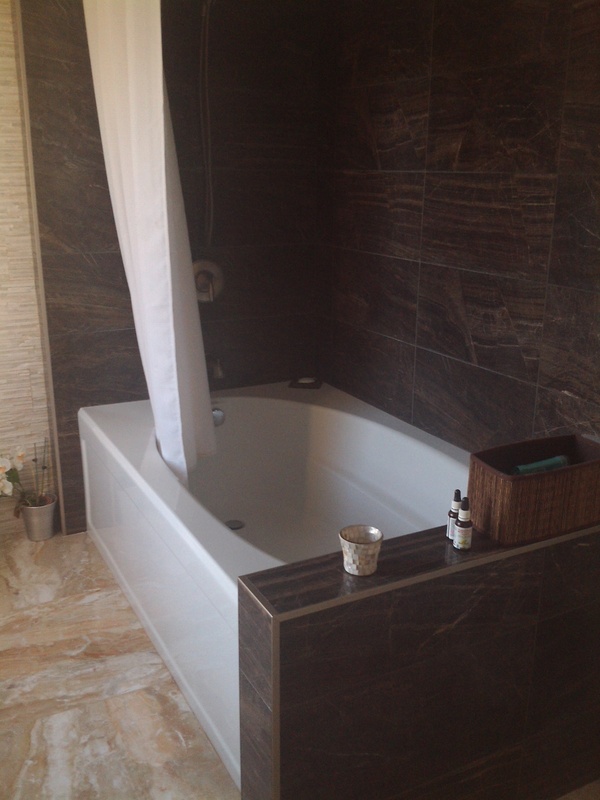 The tub we chose was the Kohler Windward 6 foot tub with apron attached. I wanted a clean look and didn’t want to spend more on tile. 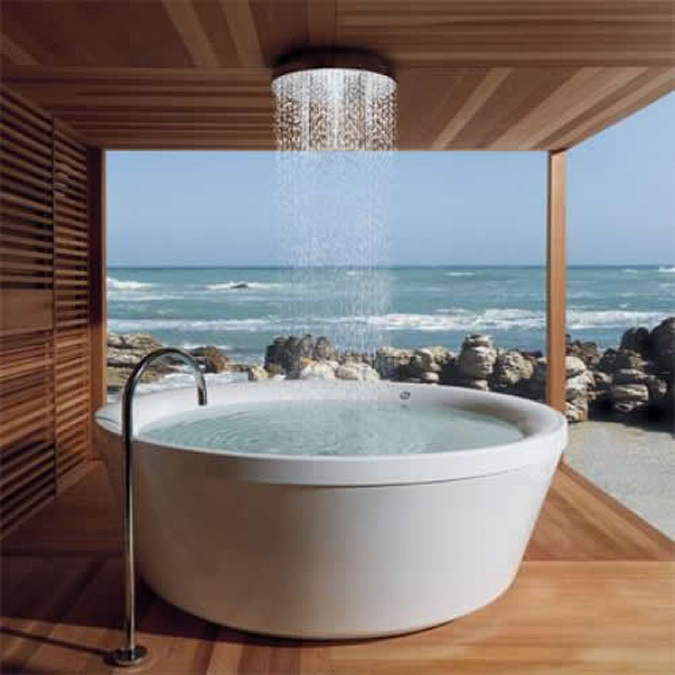 This is an awesome bathtub and it works amazing for showering applications. Compared to other brands and models with a price range of $2,000-$4,500 we found this model fairly reasonable. In Canada it cost $1150 and in the states you can find it for $800. It is long. It fits my husband and I and has room for more! It sometimes is so long we slide. There is an arm rest. You can only fill it up partially if you want a quick bath. 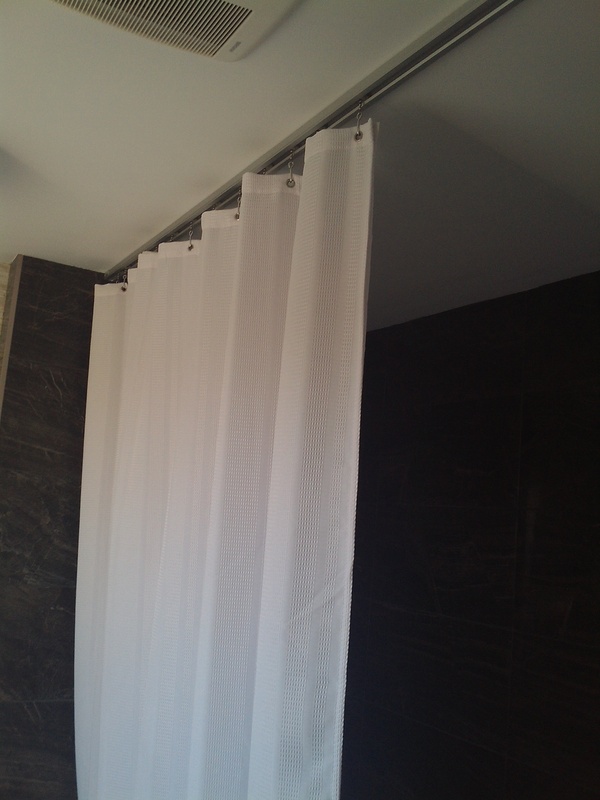 It has a ledge for shower application and further more the ledges slightly tilt inward to keep water from seeping out. You can still place candles and wine glasses around the ledge but it has a slight tilt. It is wide! 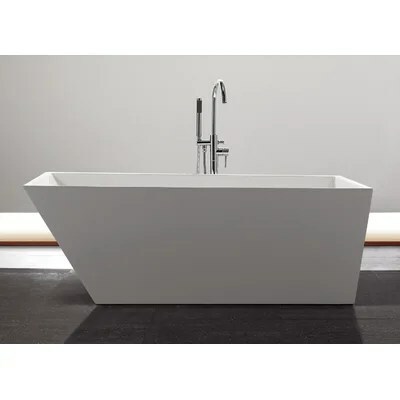 Normal tubs are only 22” wide but this piece of work is 46”. Needless to say our bathroom is all bath. We went with brushed nickle finishes, so everything isn’t too shiny. 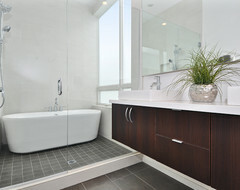 We chose a glass sink to modernize and went with a wall installation to maximize space. 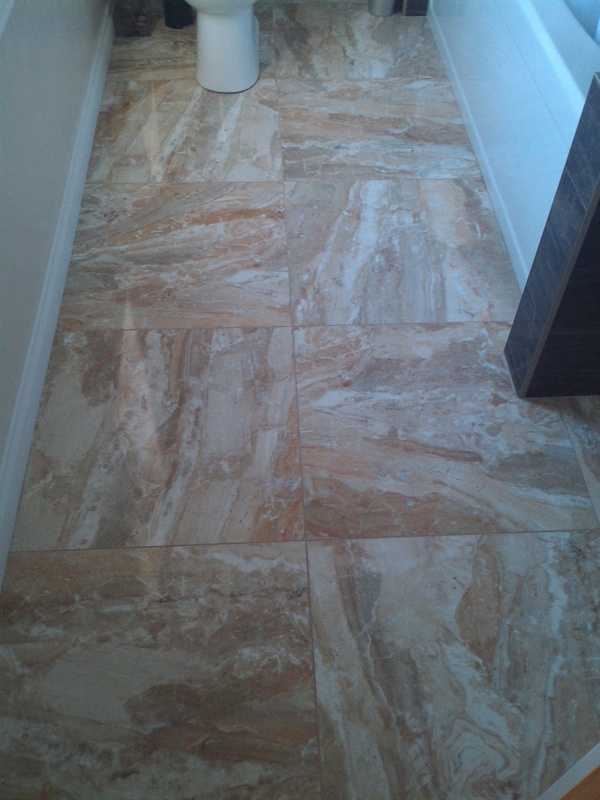 For tile we took our chances and it looked like a hot mess in the boxes, but once installed it all came together. We first fell in love with the flooring. I found a surface marble that was 24” x 24”. Everyone tried to talk us out of it. The floor guy said it wouldn’t look right in our tiny space, the renovator said it was a tricky installation. We had him re lay the floors for an even finish. Now it is the thing people notice when they see our bathroom. For such a small space it was worth the extra money and it has so many colors to work with. 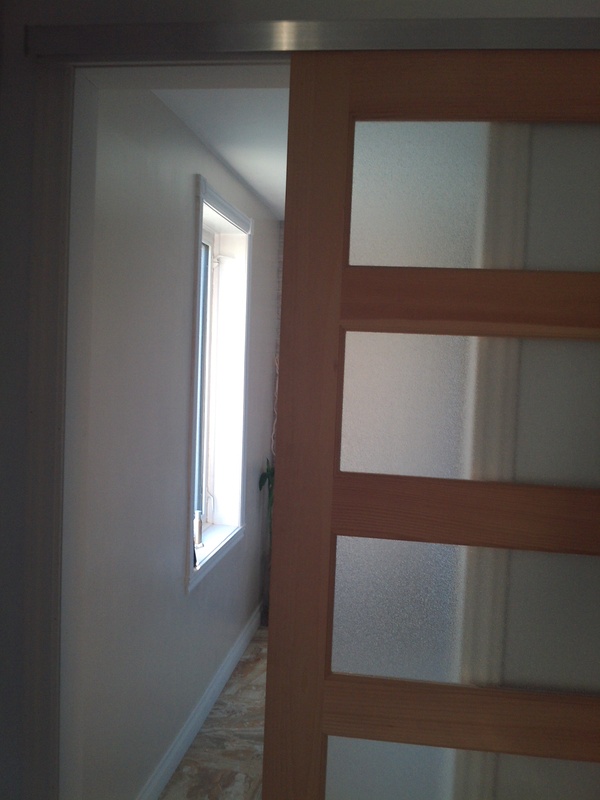 Our door opens up left of our bed and the first thing you see is the toilet and back wall. 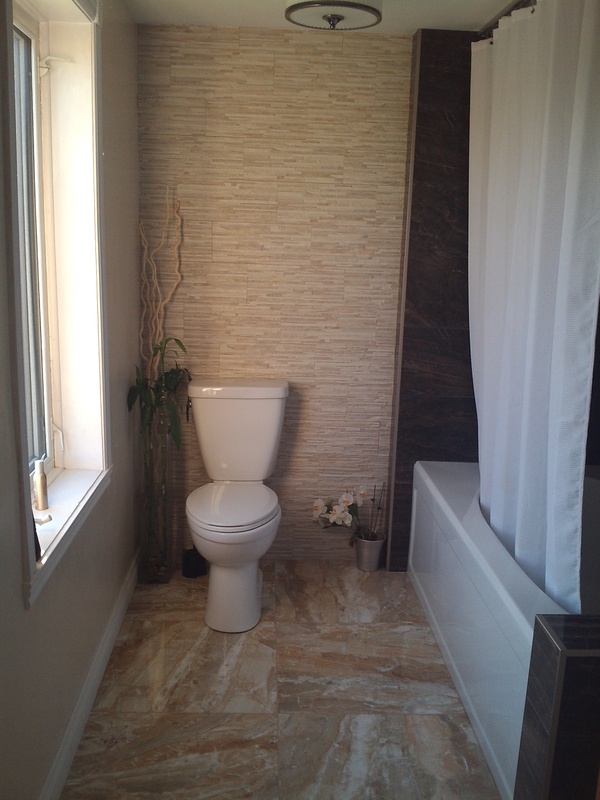 We chose natural Italian stone for an Organic backdrop, it is so relaxing to look at. I wanted a funky white texture of tile for the bath, but my husband wanted black tile, which I told him wouldn’t go with our whole theme and floor color combo. I brought home samples and he chose an Italian ceramic of dark brown (he still thinks it’s black haha) and beige. I was hesitant at first, but it definitely brings the whole room together. It creates a warm spa like atmosphere. White on white would have been too much. 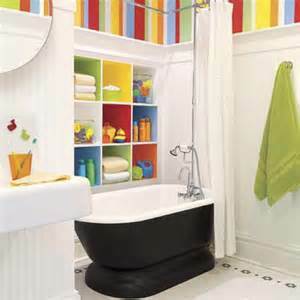 Finding a shower curtain for large tubs is painful. I didn’t want lots of bars and something hooking into the walls, so I opted for a smooth track on the ceiling. 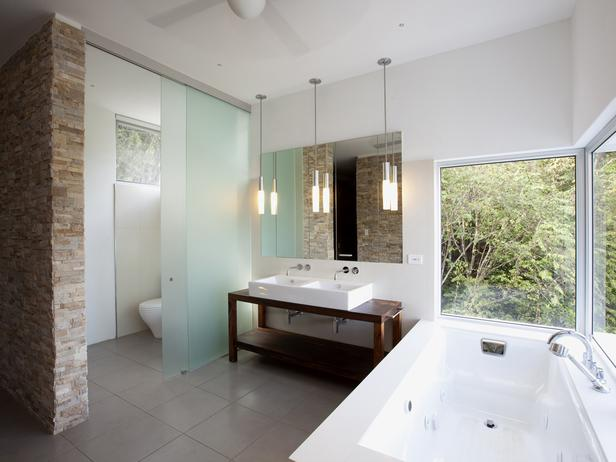 It maximizes light and space and has a clean modern look and feel. We accented with rocks and bamboo and and orchid plant. 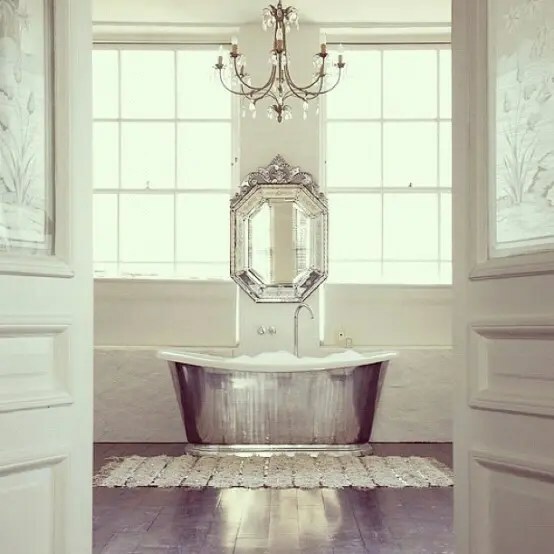 Our bathroom is my favorite room in the house, it’s a girls dream. 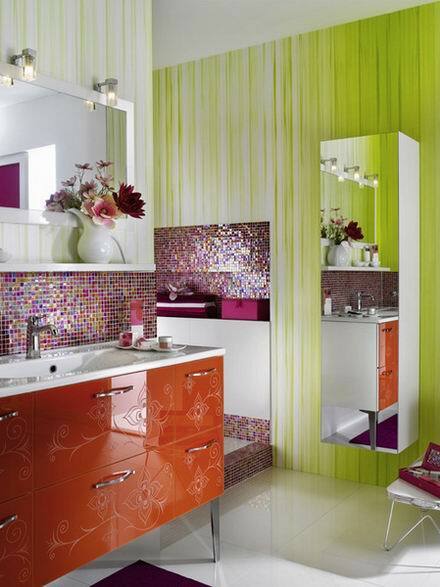 Here are some bathroom inspiration you may enjoy. What style speaks to you? 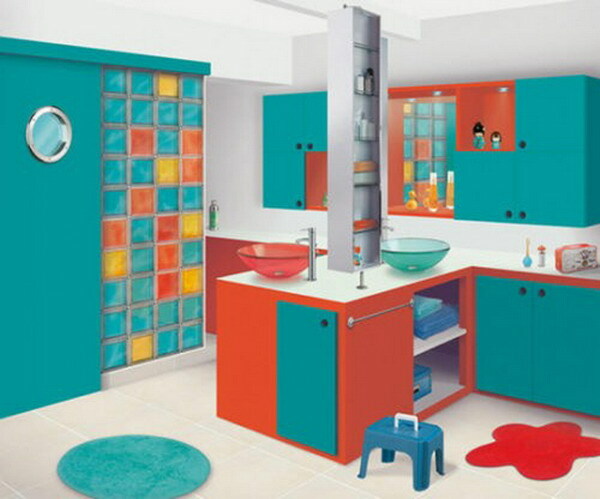 I wish I had more bathrooms to renovate!